Find More Images on the end of the post. The Episode starts with Sita standing inside Laxman Rekha. Ram and Laxman come there. Laxman tells Sita that Ram has made Sampati free of his anger. 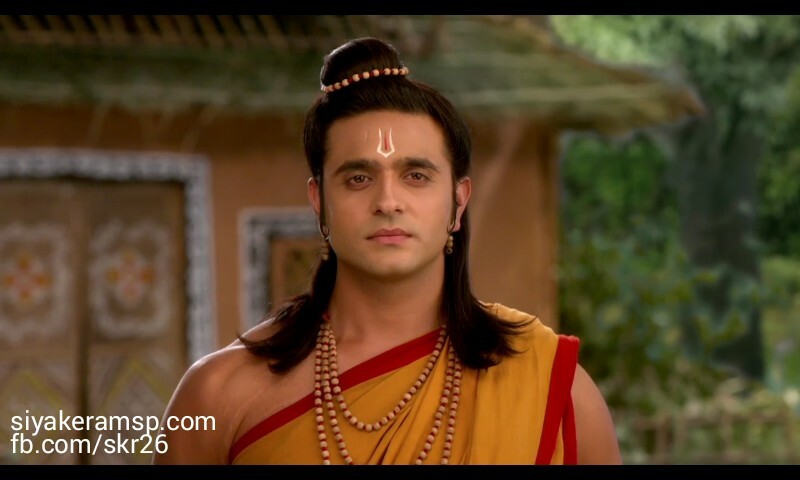 Ram says no Laxman, it was Sita’s thought to make Sampati free of his bandhan. She says its such good deed to make someone free of some bandhan, and talks about bandhan set by oneself or others. Laxman says whatever I did was for your protection. Ram looks at her. She smiles and touches the Rekha, while Laxman asks him to stop. The Rekha breaks. Sita says there is difference between protection and bandhan, people think they protect others and bound others, they satisfy themselves doing this, I m able to protect myself, I did not need this protection, I know you want good for me. Laxman says I was just fulfilling my duty, I did mistake making this Rekha, I will create such Rekha next time that you can cross and no one else can, I m sorry to hurt you, let me protect you for my heart peace. You see the jungle by other perspective, I m warrior and I sense danger everywhere, it should not happen that my fear comes infront of us as reality. Ram looks on. Meghnadh is angry on his uncles/Raavan’s ministers for failing to kill Sugreev. Malyavaan looks on. Meghnadh asks what happened there. The man says we did as you said, we have beaten Sugreev a lot. Meghnadh keeps sword on their neck and says I want to know truth. They say they are Mandodari’s brothers, and asks him to move sword. They tell Meghnadh about the problem, Hanuman, we can’t do any harm to the monkeys till Hanuman is there, else we would have killed Sugreev, he has beaten us a lot. Meghnadh gets angry and says no one can come in between our victory mark, even ……. And calls Rahu and Ketu. Rahu and Ketu ask Meghnadh to command. Meghnadh asks do they remember Hanuman. Ketu says yes, he has insulted us. Rahu says we will take revenge from Hanuman. Meghnadh says its time to take revenge, go and teach him a lesson. Rahu and Ketu leave. Meghnadh’s uncles also leave. Chatayu flies and sees the village. He informs Ram, Sita and Laxman that people returned to the place and there is peace, all because of you. Sita talks to him and asks about his brother Sampati. Sampati comes out of the den and smiles seeing sunlight. Chatayu says Sampati has broke all the bounds and flew in sunlight, he left this feather for me, he wants to spend his life in Brahma ashram, I m very happy seeing him. Sita says Sampati got free of his bounds and you got free of your Maryada, we are glad you can fly and stay freely. Chatayu says but I have no one else in this world, I got alone, I wish to stay with you all for some time. Sita smiles. Chatayu asks can I come here to this hut. Ram smiles and says don’t be hesitant, think this hut is your home and regard us as family, from today, you are not alone in this world. He holds Chatayu. Chatayu keeps his hand on his head. Ram blesses him. Hanuman sees the sketch and says I m waiting for you, whenever I close eyes, I see you, how long will you make me wait. Rahu and Ketu come there and say you will see us when you open eyes. Hanuman smiles seeing Rahu and Ketu. He reminds how he has beaten them in his childhood. Rahu says we came to take revenge. Kahu says we are going to swallow the sun again, if you have courage, then stop us. Hanuman asks how dare you try to put grahan/eclipse on my Surya Dev. He rushes after them. Meghnadh’s uncles see this and laugh, saying Hanuman is gone, who will save Sugreev from us now. Hanuman says Rahu and Ketu did mistake to provoke me, I will see who will save them. He flies after them. Rahu says first you have to catch us. Hanuman smiles. Sita prays infront of tulsi plant. Ram also dhyaan and prays. Laxman gives the good news that people who left by Rakshaks fear have come back to stay, they want to meet you, when shall I call them. Ram says no, we should go and meet them seeing their devotion, if they have any problem, we should help them. Ram and Sita smile seeing each other. Ram leaves with Laxman. Sita hears some women crying and says why do I feel there is someone is big problem. A rakshasi woman and child move to the lake and are committing suicide, saying just death can end our sorrow now. All other Rakshaks families look on. Sita stops them and asks them to come. She asks the lady how was she helpless to take her son along, and why did everyone not stop her. The lady says we have no other way. Sita asks whats the reason of your sorrow. The lady says do you really want to know, then listen, you are the reason of our total sorrows, our state is because of you, we all became widows, our sons lost their fathers…. Sita gets shocked and asks because of me? The lady says yes, your husband and Devar killed our husbands to show their power. Sita says Raghunandan can’t kill any innocent person, he killed the Rakshaks who were troubling Rishis. The lady says we are wives of those men, whats our mistake, they should have killed us and our children too. Another lady asks Sita to tell what is this justice to kill anyone without knowing truth, on what basis did they do this. The lady asks what did my husband do harm to your husband, do you know their enmity, why did our husbands die…. Look at them, your husband and Devar made all children orphan. The boy says my father went to get food for me and my mother says some sanyasis killed him, why did they kill my dad, tell me. Sita cries. Hanuman comes infront of Rahu and Ketu, and is about to beat them.